If you ask a Chief Executive Officer (CEO) of a typical multinational organization where they’re focused this year and next, you’re likely to hear them describe a commercial growth scenario. 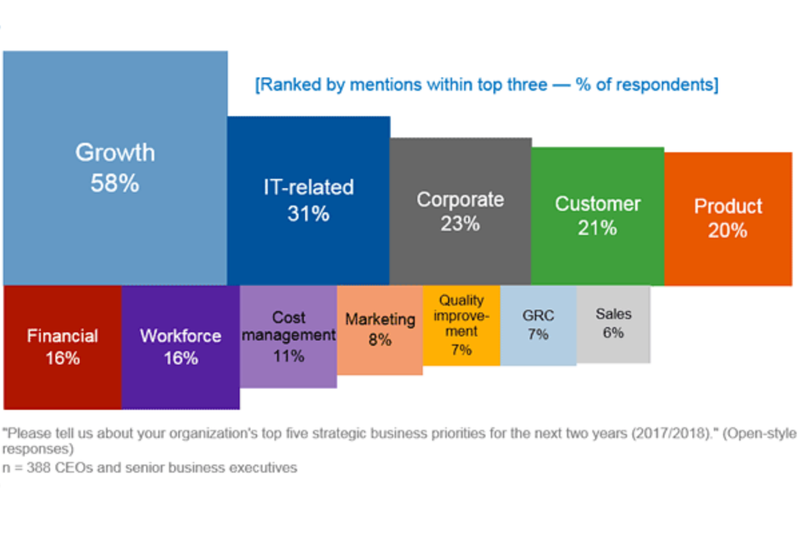 According to the findings from a recent Gartner market study, growth is now the number one business priority for 58 percent of CEOs – that’s up from 42 percent in 2016. Gartner surveyed CEOs and senior business leaders within organizations worldwide during the fourth quarter of 2016, with the goal to examine their business technology issues and areas of IT infrastructure impact. Most responding companies had an annual revenue of $1 billion or more. Two key insights standout from the Gartner market assessment, many of the CEO leaders have embarked on a digital business transformation project, and they’re committed to hybrid IT strategies that include a reinvestment in on-premises compute and storage infrastructure. Gartner analysts refer to this trend as the ‘Reinternalization of IT’ – i.e. bringing the business technology capability back to the core of the organization, due to its importance as a strategic competitive advantage. This trend is also driving the development of new IT staff skills and capabilities. So, who is defining the success criteria for a bold IT infrastructure investment agenda? Per the Gartner study, 47 percent of respondent CEOs are being challenged by their board of directors to make progress in digital business, and 56 percent said that their efforts have already improved profits. Today, most CIOs must manage existing IT infrastructure while supporting new demands for the flexible systems that can enable digital transformation. Therefore, many leading organizations are now blending traditional on-premises and cloud-based solutions to achieve their bold IT goals. In a recent four-part editorial series that I authored, I’ve explained how today’s modern mainframe platforms offer compelling benefits that are unique to these powerful computing servers. While most enterprise IT environments already include some combination of centralized on-premises system of record (SoR) and distributed off-premises system of engagement (SoE) platforms, there are compelling incentives for simplifying the hybrid configuration and thereby improving performance. I’ve also outlined how it’s now possible, and highly desirable, to combine back-end SoR workloads and front-end SoE applications on the same high-performance large server platform. I noted that numerous enterprise software vendors are supporting Linux on IBM z Systems, such as SAP and Oracle, as well as an established and growing ecosystem of open source software such as Docker, Go, Chef, Puppet, MongoDB, PostgreSQL, Apache Spark and Node.js. Fueled by the adoption of a comprehensive stack of open-source components including the operating system, hypervisor and application runtime layers, z Systems technology can help clients develop and deploy new applications with significant responsiveness using some of the latest approaches and tools. See this video animation that demonstrates those capabilities. At IBM’s request, IDC selected and interviewed nine organizations with significant mainframe operations and three additional organizations that provided qualitative feedback for their independent study. The enterprises they chose were diverse and included multinational organizations. Per the IDC study, these organizations all rely upon their mainframe platforms to support their most critical internal and customer-facing operations that generate billions of dollars of revenue each year. The IDC study has determined that organizations pursuing what they have labeled a “connected mainframe” strategy are engaged in two IT infrastructure initiatives that drive business innovation – ongoing modernization and application integration. The following presentation includes a short summary of the comprehensive 20-page IDC white paper, sponsored by CA Technologies and IBM, entitled “The Business Value of the Connected Mainframe for Digital Transformation.” Download it now to explore the background data plus tables and charts that accompany their research findings. To learn more, review our customer success stories, then reach out to an IBM representative or business partner. Editors Note: This post was written by David H. Deans who is an IBMer and I recommend you follow him here @dhdeans. Previous Previous post: Should DB2 have an Immutable Table Function? A copywriter sick of bad grammar.